We called her Nana Julie but I don’t recall why; her name was Julia. My other grandmother was Nana Car… because she was the one that drove. I will take no responsibility for the naming as I am sure my brother was responsible for these. He was brilliant. This time of year I think of them both often. Perhaps because we are in the middle of the first Hannukah without kids home and the holiday seems so quiet. Or maybe it is because a blustery winter day like today reminded me of Nana Julie’s kitchen, with it’s Dentyne in the cabinet – both red and green, no one liked the green – and this cookie jar on the counter. The counter tops had this great 1950s boomerang formica and there was always a Pyrex glass coffee pot on the stove to boil water. When she died I took very few things from her house, but this cookie jar was one of them. It was always filled with Fig Newtons, and they were ALWAYS just a little stale. It was not until I was grown that I knew that Fig Newtons were supposed to be soft. I still sort of miss the stale ones. We kids loved that kitchen. My grandparents lived close by, and near the beach, so we spent many of our childhood weekends at their house. I cannot even imagine how many cases of Fig Newtons and Dentyne we must have polished off through the years. And now that I think of it I am not sure if she ever had any other cookies or candy in the house. I AM sure we did not care one bit. As a young adult I was fortunate to still have the Nana’s in my life. They were close; they called each other ‘sister’. I feel so very fortunate to have had them for so long. Nana Julie’s solution to any problem was to make a cup of tea and then sit down and talk about it. This afternoon it was chilly, I was losing my motivation and I had this undying craving for Fig Newtons and a cup of tea. There was something so very comforting about that snack. As if she were right there in the room with me. I suppose she was. Perhaps they both were. my mom would always drink tea and “talk about it” too, swear it is the best way to get out of a sticky situation lol 🙂 good ole tea! Sure they were, both of them. 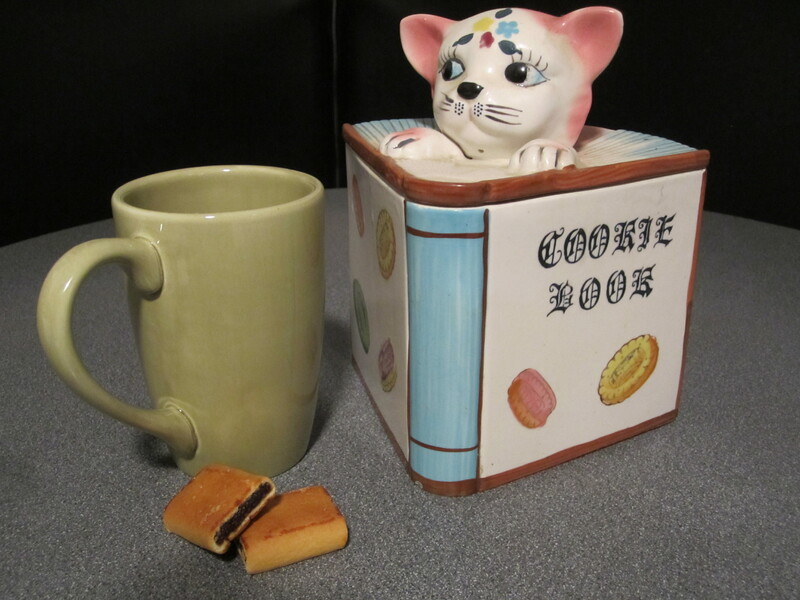 That’s a fantastic cookie jar, and Fig Newtons are called Fig Rolls in Ireland – should you ever have a hanker for the things when you’re here. Oh Amy, I too was blessed with the most amazing Nana (nana’s mom). I still think about her often. She lived in Cali and would fly in and stay for weeks at a time. The kitchen hummed with awesome food and baked goods (yes the brownies) and we were always playing cards or Yahtzee – with the leather shakers of course. You stole my line. When I was a kid, last century, we bought fig newtons from a big box in the appetizing store, they were always hard. When I ate them for the first time in Nana Julie’s house, in Brooklyn, they were soft. I thought they were not baked thru. They are also your mother’s favorite. It’s in the genes. Mom says that both Nana’s are also with her at certain times. Aren’t we lucky?